In recent years, many researchers have been engaged in the development of educational computer games; however, previous studies have indicated that, without supportive models that take individual students’ learning needs or difficulties into consideration, students might only show temporary interest during the learning process, and their learning performance is often not as good as expected. Learning styles have been recognized as being an important human factor affecting students’ learning performance. Previous studies have shown that, by taking learning styles into account, learning systems can be of greater benefit to students owing to the provision of personalized learning content presentation that matches the information perceiving and processing styles of individuals. 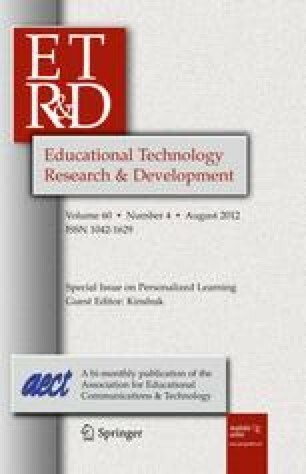 In this paper, a personalized game-based learning approach is proposed based on the sequential/global dimension of the learning style proposed by Felder and Silverman. To evaluate the effectiveness of the proposed approach, a role-playing game has been implemented based on the approach; moreover, an experiment has been conducted on an elementary school natural science course. From the experimental results, it is found that the personalized educational computer game not only promotes learning motivation, but also improves the learning achievements of the students. The authors would like to thank Mr. Li-Hsueh Yang for his assistance in developing the educational computer game. This study is supported in part by the National Science Council of the Republic of China under contract numbers NSC 99-2511-S-011-011-MY3 and NSC 100-2631-S-011-003. Coffield, F., Moseley, D., Hall, E., & Ecclestone, K. (2004). Learning styles and pedagogy in post-16 learning: a systematic and critical review. London: Learning and Skills Research Centre http://www.lsneducation.org.uk/research/reports/. Soloman, B. A., & Felder, R. M. (2001). Index of learning styles questionnaire. Retrieved August 4, 2011, from North Carolina State University, http://www.engr.ncsu.edu/learningstyles/ilsweb.html.